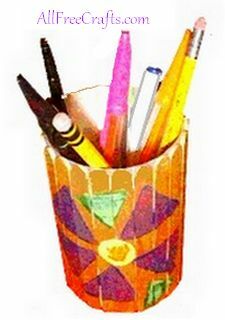 Use Mom’s favorite colors if you make this pencil holder as a homemade gift for Mother’s Day. 1. Take the paper label off the container. Line up a popsicle stick, straight up and down, so that the bottom of the stick is just touching the bottom of the container and top of the stick goes just over the top of the container. Glue in place. Glue another popsicle stick next to the first one then repeat until you have glued on popsicle sticks all the way around. 2. Paint the popsicle sticks. I chose to paint them in gold, but you could use your Mom’s favorite color, except green, because you’ll want to paint on green leaves. Let the paint dry. 3. Wet a household sponge, then squeeze all the water out and cut out a circle. This will make the center of the flower. Pat the circle into some craft paint, experiment on a piece of paper first, then place in the center of your canister. 4. Now with the make up sponge, not wet, pat into another color and place the sponge with the point facing the center circle and press into the container to make a petal shape. Do five all together around the circle. You will have enough room to do one more flower. Now rinse out your makeup sponge and cut it in half. This will make a leaf shape. You can do one or more in between the flower petal and some around the spaces around your container. Spray or brush on a sealer.